You can purchase Spam Reader Professional online by filling in the online purchase form. When you purchase Spam Reader Pro you receive a unique serial number. The number is requested during the registration of your program copy. You can register your copy automatically or by e-mail. To start Spam Reader registration click "Upgrade to Pro" button on the program toolbar or "Upgrade to Pro" command in the menu. You will see the following dialog. If you choose to register automatically enter the serial number and click "Register" button. If the automatic registration is successful you will immediately receive the program notification. In case the automatic registration failed, you should try to register by e-mail. Enter the serial number and click "Register by e-mail..." button. 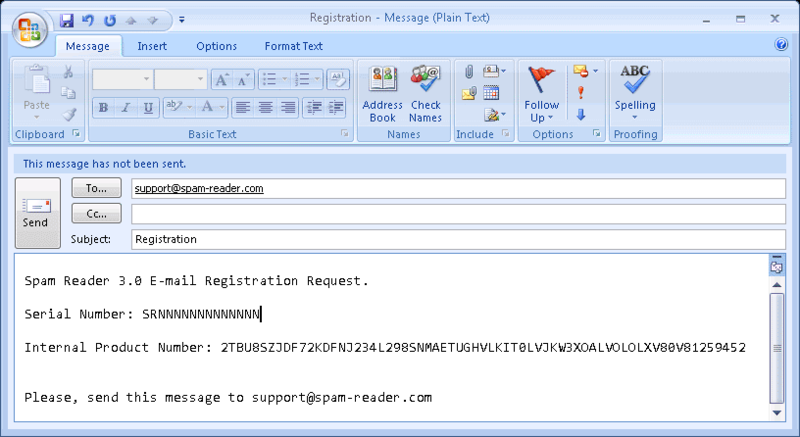  Spam Reader will automatically create an e-mail message with the information necessary for registration. Click "Send" button to send the message.  In response you will receive the special registration zip file. Save it on the hard disk on the computer where your copy of Spam Reader is installed, unpack it and run "Spam Reader Registration.reg" file. You can check if the registration is successful on About tab of program options. If your copy is successfully registered you will see "Registered version". If you have any problems or questions related to the registration of Spam Reader, please contact us at support@spam-reader.com. Our support team will assist you with the registration. If you lost your serial number , please send us a message with the full purchasing information: your name, company name, email address and order ID. In response you will receive your serial number.